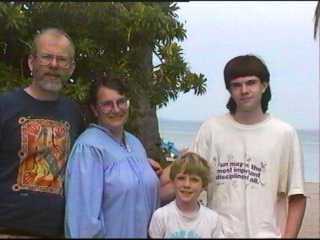 Robert, Ann, Tommy, and Chris Wells, vacationing on South Water Caye, Belize, C.A., March, 1996. Used on Wells Family home page from September 4, 1996 thru November 27, 1998. Robert, Ann, Tommy, and Chris Wells, in front of our Vessel painting by our friend Madeleine Tuckfield-Carrano of Annandale, New South Wales, Australia. 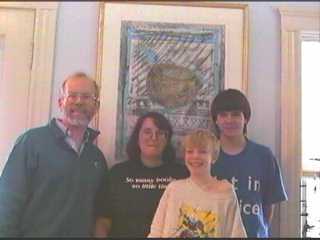 Used on Wells family home page from inception thru Sept. 3, 1996. Contact robert@wellscs.com | Updated November 28, 1998.